Vet Aquadent Anti Plaque Solution for Cats and Dogs has been developed by vets. It is a refreshing and palatable solution, containing chlorhexidine and xylitol (limits dental plaque and tartar formation) to help fight your pet's bad breath. Just simply added to your pets drinking water. Keep out of reach of children. Formulated for cats and dogs. Store at room temperature. 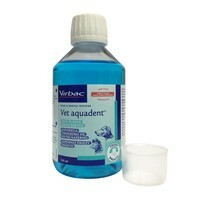 For dogs and cats more than 6 months old add 1ml of Vet Aquadent to every 100ml of water. Replace drinking water every 24 hours, even if not finished, using fresh diluted solution, as directed above. This is a brilliant product been using it for about 5 years now and it does work. I show my dogs so their teeth have to be really clean. I do find it expensive though. It seems to work but i only put it in my cats water bowl every other day otherwise it wouldnt last long. Maybe i should try every day. Recommended by Vet to aid our dental control of our rescue greyhound alongside toothpaste brushing. It keeps the teeth free from plaque. Love this stuff! Before I could take my whippet to the vets to have her teeth sorted properly this really helped with her stinky breath. Even better, now that she's had her bad teeth removed and a professional clean it's really helping to keep her gums in great shape too! Very effective. My dog's bad breath is greatly reduced and - despite bad plaque - his gums are in excellent condition. Been using this on my 12 year old Westie for the past month and what a difference it has made! Have been using this product for about a year and would definitely recommend. Seen a great improvement in the freshness of my 11 year old Lab's breath plus at his last check up the vet commented that he had no gum disease. Both my cats had dental problems when they were 3 years old and had to have veterinary treatment. My vet recommended this product as part of their dental regime but it was very expensive from them. I frequently use this website and was very pleased to find it here at a much cheaper price. The cats still drink their water as usual so it doesn't affect the taste. Their teeth have been in good condition when the vet has checked since. Thanks VetUK! This product is excellent. Used this to keep my Bearded Collie's teeth clean after having dental treatment and my Chihuahua also drinks the same water. Have had no problems getting the dogs to drink the water containing this rinse. The vet has even commented that my Chi's teeth are in amazingly good condition through using the rinse. It has definitely helped prevent any problems so far. I am unimpressed with this product. Neither of my Large Bernese Mountain Dogs will drink the water when this is added to their water bowl. The bowl holds 1,500 ml of water therefore at the recommend amount of 6ml of Vet Aquadent to every 250ml of water the water is decidedly green as I have to add 36ml of Vet Aquadent. After taking the dogs for a walk they usually have a big drink of but all the dogs including my Parsons Jack Russell refused to drink with this product in the water. This is a complete waste of money. Used for a month now by both my dogs and has drastically reduced the gum inflammation in my six year old spaniel. Excellent product, used by all three cats and the dog. A super way to help with dental care. After only 1 year my rescue greyhound's gums were getting inflamed through buildup of plaque requiring expensive dental treatment. They are noted for this. On the vet's recommendation after adding it to his water, plus using logic gel nightly, 9 months later his teeth are still pearly white. My chinchilla cats had so many teeth ops in their lifetime I wish I had known of this.Wonderful stuff - and he likes the taste! I bought this product on the recommendation of my vet to help keep my cat's teeth in good condition. She informed me that this product would help to keep my cat's teeth clean and prevent plaque build-up. The product is easily used just by adding it to the water bowl. In my home my cat and my dog share the same water bowl so I was hoping that my dog's teeth might get some benefit too, although they were not in a good state as he is 15 years old. We have only been using this product for a few weeks and the effect on my dog's teeth is really noticeable. Not only do his teeth seem a lot cleaner, but his breath is beautifully fresh too! He also clearly enjoys drinking this water which is good as I was worried that he would notice the additive and just not drink. The effect on the cat's teeth is not so clear as they were in better condition anyway but am hopeful that he will benefit from preventative aspects. I would definitely recommend this product.